This cartoon is kind of funny and could be on a snow plowing flyer you might receive at your home or office. No one wants to be late for the office or have the kids miss their bus in the morning and be late for school. But if there is a large snowfall and the city plows have piled the snow at the end of your driveway, what are you going to do. If you have your own snow blower it means that you need to get outside and clear the driveway before you go to work. It means getting up 20 minutes earlier and clearing the snow. Also hoping that the city snow plow does not come along just after you have cleaned your driveway of snow. Also you may smell from the fumes of the snow blower. So you may have to have a shower before you get dressed and go to work. The city plows may still fill your driveway with snow just before you leave for work. At least you can have something written into your contract to cover this situation. It should specify your driveway is to be cleared prior to 7 AM so that you can get out to work and the kids off to school on time. If you decide to follow-up on a flyer that appears in your mailbox, also check with neighbors to determine who they have used. Are they reliable. Ask the contractor for recommendations and follow-up with his customers to ensure they are satisfied. You may also want to ask for several quotes. It helps to confirm you are paying a reasonable price for the clearing of snow from driveway, steps and walk ways. If you require specific services, make sure they are in the contract. You do not want to miss anything. Or get a surprise when some service you were expecting is not delivered even though you had discussed it. If it is not on the contract then you probably will not receive the service unless you are very fortunate. Our neighbors have used a snow clearing service for the past few years. They have received several competitive offers from a variety of companies this year. They were wondering if they should change for the sake of a lower offer. We suggested that if they are happy with the service you should probably stick with their current provider. If they are concerned about the price, they can always try negotiating a better price. But in the end you have to be prepared for them to say that their price is what it is. The worst that can happen is that they say no. While a positive answer can mean more service or a better price or both. Use the snow plow flyers to compare prices. 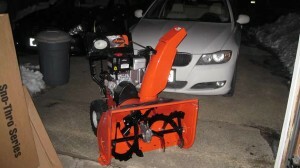 Make your decision regarding which is the best deal for your snow plowing needs. 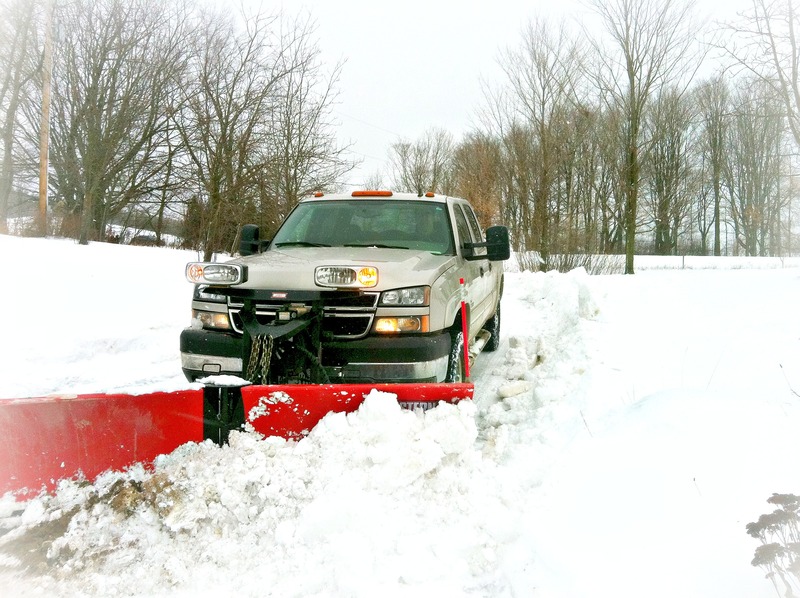 What snow removal methods will you use this year? The picture on the left is a bit extreme! 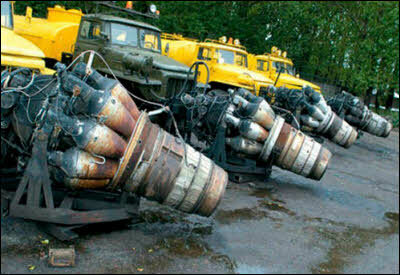 Obviously you will not be using these jet engines to clear snow off your driveway, but it is important to have a discussion about what method will be used and whether it will harm your driveway or not. For example if you have a brand new interlocking brick driveway, do you really want someone with a steel blade clearing snow off your driveway? Perhaps one with a Teflon blade would be better and will not harm your driveway. Where do you want the snow placed when it is removed? Will they dig up the grass in the process and damage your lawn. How do they mark the ends of the driveway or other important items that you do not want damaged? These are all questions to take into account when you are discussing snow removal methods with your contractor. Do you want the steps cleared of snow? How often should they clear snow and when will they clear snow given snow falls, the routine of the city plows and your need to get out to go to work. Clearing the snow yourself is probably the safest method in terms of protecting your driveway. After all you will take more care and time to make sure the job is done right. Still concern about the driveway and scraping it with the snow blower is a concern to be watched for. Then there are the health issues of people shoveling snow and dropping dead in the process. Take this aspect into account when you are making a decision to do it yourself or hire somebody to do the work for you. Buying a snow blower might be a better answer vs. shoveling snow. When you hire a contractor, there are lots of things to discuss. Check on what equipment will be used and what damage could be done to your driveway. Also discuss how often the snow will be cleared. How much snow will need to fall before they will come to your home? Ask whether they will clear the steps or not. Many homeowners will save themselves a little money by clearing the snow off the steps with their own shovel. But this is something that can be arranged to be completed on your behalf as well. 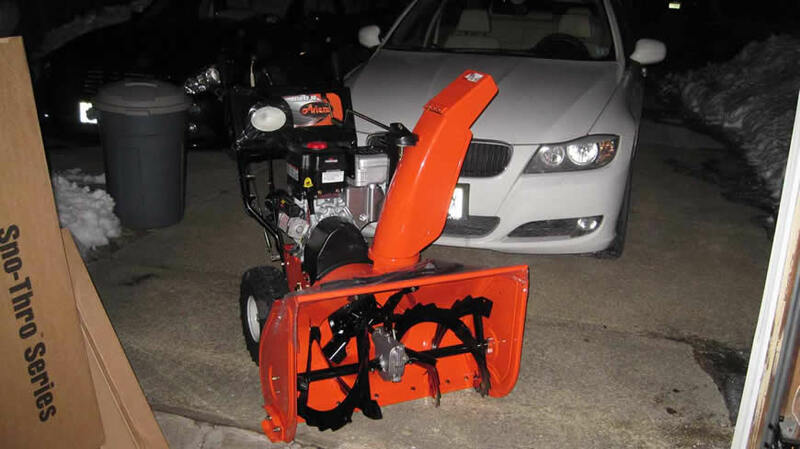 We find that a tractor mounted snow blower with Teflon coated blades will do the best job and it will generally not damage or scratch your driveway. This is a discussion that you must have with the operator and it must also be clearly written into the contract as well to provide you with protection should there be any problems. Another item to consider is getting some of your neighbors together and negotiating a common price. It is better for the snow removal contractor since he gets more work in one area and does not have as much travel time so he saves money. Sometimes they will pass along some of these savings and provide a better price for snow clearing services. 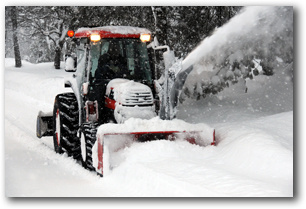 August and September is the time to lock in a snow removal company contract. While we are thinking of the end of summer and the coming fall, it might be a good time to lock in a contract for snow removal at a pre-season price. Many companies are still focused on summer time activities such as landscaping and lawn care. But they will have someone answering the phones who can set up contracts and negotiate the best deal. Whether you need driveway snow removal, steps cleared or even your roof cleared of snow. You might include these items in your contract. If you are considering clearing your own snow, especially off the roof, you may want to reconsider this activity. It is very dangerous for a number of reasons to clear your own snow from driveways and roofs. 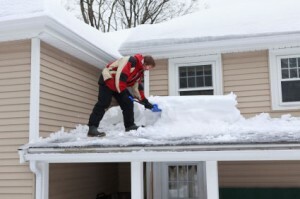 Many consumers fall off their roof every year while clearing snow. They may be using the wrong type of boots and do not have the proper grip, they may not take sufficient safety procedures and they may have a heart attack while shoveling snow. Thousands of consumers suffer heart attacks every year. Because they have been a couch potato all year and then start shoveling snow. Too much exertion that their hearts cannot with stand and they get into trouble! Hire a contractor and reduce the risk! And you should have a contract rather than just an understanding. Even if your neighbor is the one clearing snow, your expectations should be written down and he should be reviewing and signing off on what will be done and importantly what will not be done. The larger snow removal companies will have proper contracts, but the message is still the same. If the service is not on the contract, there is a pretty good chance that the service you are looking for will not be provided. You may want to add it as a service sometime later on, If so you can be sure that it is going to cost extra money for that portion that was not included in your contract. Don’t make assumptions. Specify what it is you are looking for. Discuss it with the the snow removal company and make sure that this service you need is included in the price. Payments for services rendered is a good approach. But most companies are afraid of non payment after having the services provided. A compromise is often a good approach. Perhaps 10% down, non refundable to show good intent, 45% at the beginning of the season. The remainder halfway through the contract. This protects both parties and if there is a disagreement, the homeowner has at least a method of getting the companies attention. Payment up front for the entire season is definitely not a recommended approach. All of the risk is on the homeowners side and there have just been too many issues with companies not providing what the home owner thought they had agreed to. The details of your contract will lay out the Snow Removal Procedures that you can expect and will be followed by the contractor when they are clearing snow from your driveway. If the contractor is indicating that there is no contract, you should probably be suspicious. Unless you really trust this person. The contract spells out the amount that will be paid. When it will be paid if their are progress payments. Also the timing of snow clearing. How much snow must fall before they will clear your driveway? How they will handle returns if the city snow plow clears the street after your driveway has been cleared? You may also have special requirements as well such as Teflon coated blades that will not scratch your driveway or damage your interlocking stones. If you have stone edges along your driveway as a border, you definitely do not want these damaged as well. Make sure that these special instructions are included in your contract. These details are important for you to understand. Also managing your expectations with respect to clearing the snow by the contractor. This is not rocket science. However it is amazing how contractors can do something different than what you were expecting. Unless it is spelled out in a contract and discussed with them. This can be a key concern for many home owners. Your contract will specify how much snow must fall before the snow plow contractor will come to clear your driveway. It must also specify who provides the information. Most will rely on local weather. Which might mean you could get more than the minimum in your immediate area while the rest of the city does not get any snow. We suggest you pay attention to how much snow must fall and how it will be determined or measured. If an inch must fall based on the local weather report and you get drifting that fills your driveway, what are you going to do. Call them and pay extra? Shovel it yourself or just leave it and hope it snows enough so that they will come to clear your driveway of snow. We have all been very frustrated when we have just had our driveway cleared. Only to have the city snow plow clear the street an hour later leaving a large amount of snow at the end of the driveway. Will your contractor return and how soon will he be back. This could be important if you still need to get your car out of the driveway in order to get to work or an appointment. With heavy snows, the city plows can leave a large amount of snow at the end of your driveway. Which can be a lot of work to clear unless your contractor is coming back to clear it for you. Focus on the details of your contractor contract and ask all of the what if questions to determine your understanding and to determine if the contract requires adjustment. We have been writing a lot of posts about Snow Clearance Contractors, hiring contractors and making sure that the contract is clear about what services will be provided and when they will be provided. In this post we are going to change our approach a bit. We are going to go back to asking the question about the economics of clearing snow yourself vs. having someone do it for you. Both situations cost money. When you decide to clear snow yourself, it can be an inconvenience. But then in the end you get some exercise and some fresh air. Before we start, we also wanted to mention that if you are a couch potato and suddenly decide to shovel snow, you need to pay attention to your body. Avoid the proverbial heart attack caused by over exertion. This winter is off to an early start. There has already been several reports of people passing away due to a heart attack from shoveling snow. If you feel any pressure in your chest, stop and rest. Ask for help at the same time. The money you save is simply not worth it vs. a heart attack. If you have an average sized driveway, you can expect to pay somewhere between $300 and $600 for the season to have someone come and clear the snow off your driveway after a snowfall of at least one inch. Less than that they will not clean your driveway unless you want to pay more for this service. In addition many will only clear the driveway after the city plows have cleared your street, so you may be waiting part or even most of the day for your driveway to be cleared. A snow blower can be purchased that is suitable for an average driveway anywhere from $700 to $1500 and even higher if you want a larger model with many more bells and whistles. Let’s assume you purchase a model that costs $1000. With maintenance, oil, gas etc you may spend another $100 over the four years. Essentially it will take 4 years of contractor payments to pay for the snow blower, which is pretty good payback! From that point forward, your snow blower is saving you money and you still get the exercise and the fresh air. One word of advice, always let the snow blower do the work. Don’t try to manhandle the machine, instead use the steering mechanism and let it do all of the work! Too many people try to push the machine into the position they want or try to steer the machine by pulling or pushing it. Especially with the larger machines and even with some of the smaller ones this can be particularly strenuous to try. Instead allow the machine to come to a stop, back it up and steer it as you are moving the machine. You will find this approach much easier. Some of the new snow blowers actually have steering controls which when depressed will turn the snow blower in one direction or another. As all of us baby boomers get older there will be more and more opportunity for snow clearing companies to provide snow services in the winter time. Depending on what stats you read, there may be one in four of us who will be retired and at various capability levels over the next 20 years. This is an unprecedented opportunity for many companies to provide a variety of services to seniors and the elderly. Most of us want to remain in our homes. Most of us will be unable to perform the various maintenance tasks around the home. This means that many companies and individuals including snow plowing companies will abound. They will be available to provide services for us. It will become very important that we make sure that we have a contract that specifies what services we are supposed to get. How much they will cost and importantly when the services will be provided. Snow services for clearing snow is no different. We urge anyone who is hiring someone to clear the snow. Have a clear and well defined contract to cover them. Which ever company you hire, always have a contract that specifies what services you will receive, how often you will receive them and how much snow must fall before they will come around to clear the snow from your driveway. In addition it should specify when and how much you should pay them for these services. If you can ensure that all of these snow services are clear on the contract then you should have fewer problems and be satisfied with the service. Payment for the snow services is another issue we want to discuss. If they are looking for full payment up front, you may want to question their motives. Never pay in full, always pay in installments for your own protection. If your contractor wants all of the money up front, find another contractor. The norm appears to be ten percent on signing of the contract, 40% at the beginning of the season and 40% halfway through the winter. Both parties are protected from any fraud issues. Or if for some reason the contractor should be unable to provide the service due to business or health reasons. Someone who wants all of the money up front might be a legit contractor. However there is too much risk for the customer that the contractor will not provide the services as contracted. Or might even take off without providing the services at all. Be cautions, ask for references. Only pay in installments. Always have a clear contract. This is by far the best method of ensuring that you are going to receive the snow services that you need and want and what you have contracted for. If for some reason, it does not work out with the contractor you choose, at least you have not given them all of your money. You may not recover the initial deposit or progress payment. But at least you can limit your losses. If the contractor does not live up to his end of the bargain. Also read the fine print, the details of the contract etc to make sure that there is nothing in the contract that would cause any concern about signing the contract. If it is all one sided, you may want to renegotiate or find another contractor. Consumers are looking for reliable snow clearing services every winter instead of risking a heart attack or having to go out in the cold weather to clear their driveways. However many have different ideas about what this statement actually means. For some they are content as long as they can get their car out of the driveway in the morning. Other consumers are not happy unless the steps are shoveled. They want the driveway kept clean of snow at all times. This includes that frustrating pile of snow that the city snow plow leaves at the end of our driveways. They always seem to show up a half hour after our driveway has just been cleared. Some people want the driveway clear even if there is less than an inch of snow on the driveway. The more you ask for, the more you are going to pay for the services that you receive. If it is not written into the contract, you probably are not going to get the service you might be looking for. For example if it snows only one inch, your driveway may not be cleared. Most reliable snow clearing companies specify how much it must snow before they will come around and clear your driveway. Also note that they rely on local conditions in your town or city. You could have more snow in your driveway than people do on the other side of town. You may want to be able to call them to arrange for snow removal if the local forecast does not report that sufficient snow has fallen. Most will follow the city snow plow so that they only have to clear your driveway once during the day. If you need your driveway clear by 7 am, then this should be specified in the contract. It should also specify in the contract that they will return to clear the snow from the end of your driveway that the city snow plow operator leaves. Unless you are dealing with your next door neighbor or a family friend, you really should always have a contract regardless of how confidant you are about the company you are dealing with. Think of the contract for reliable snow clearing as a form of communication between two parties. It specifies various things about the removal of snow from your driveway. There may be some items that you are not considering which will be listed in the contract. For example most will include payment requirements. These can be one, two or three payments spread out over the season. Timing, start and end dates, price, driveway clearing, sidewalk and front step clearing should be included in the contract. This will help to ensure that there are no assumptions which can lead to disagreements later on. Even if a neighbor is doing the snow removal for you, having a clear understanding of when he will clear the snow from your driveway will avoid any disagreements or misunderstandings that you might have. It might not be a contract in legal terms, but just having the terms written down for both of you to review and agree to will avoid a misunderstanding in the middle of winter. You might wonder why we are posting an article for snow removal services in May when the snow is all but gone. Well there is one single reason and that is to remind consumers who use snow removal services that they may be able to lock in rates for the coming year . If they are happy with their current provider, why not have a conversation now with them about next years winter snow removal? Perhaps you can lock in the rate at the same level or lower than what you currently have. This could be a savings opportunity for you. 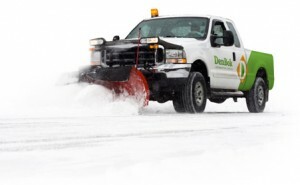 While it may be possible to negotiate an excellent rate for the coming year for your snow removal services, consumers should also be confident that the company will still be in business the coming year. They will expect at least partial payment to secure the best rate. Consumers will want to ensure that there is no danger of them going out of business and taking your money with them. You might provide them with a low down payment and pay the remainder prior to the start of the next snow removal season. A winning negotiation would be that you secure the same rate or lower as the current year and also not have to pay anything until the beginning of the next season. Perhaps 10% now to hold the rate and 45% at the beginning of the season and the remaining 45% on January 1st would be appropriate to avoid any danger of losing your full deposit. You may only need the snow to be removed from your driveway with the consumer removing the snow from the front steps. Some consumers will be willing to pay a little more and have the snow also removed from the front steps and any walkways around the house. This will incur an extra cost in addition to the driveway snow removal since it takes more time and may also involve a second crew that comes around to shovel the snow from the steps etc. Check with neighbors and friends to obtain recommendations and to also compare prices. While the snow removal services prices are pretty standard. It is nice to know that you and your next door neighbor are in fact paying the same price for similar sized driveways. Another advantage of using the same provider as your neighbor is that it gives you negotiating power when negotiating the rate. 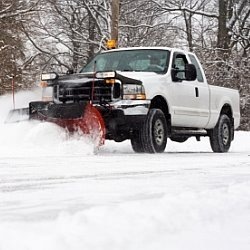 If you have a complaint, the snow removal services provider is well aware that customers talk and he will be sure to rectify your problem quickly to avoid word getting around that they provide less than great service. 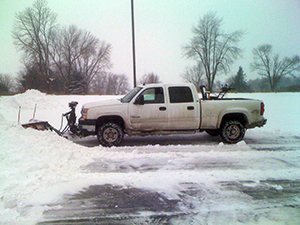 Consumers can reduce their overall cost of snow removal if they take this approach. The worst that can happen is that you ask for a discount and they give you the same price as your neighbor or other contractors. Even if you save 10% on the cost, it is money in your pocket which can be used for other things. We can all use money for other expenses no matter how well off we might be. Where is the snow plow when you need it? You received a foot of snow overnight and you have to get to work and before you can even get the car out of the garage you have to shovel the driveway. This is one of the worst situations that many people experience through the winter and many baby boomers and seniors are now opting for snow plow services to make sure that their driveway is clear of snow to get to work or just to get out for the day. In addition shoveling the snow can be dangerous ot your health especially if you are a couch potato the rest of the year. If you experience any chest pain stop immediately and get help. You could be having a heart attack. It is so much easier to just have someone do this heavy work for you. You have to get to work! The last thing you want to do is to shovel snow before going to work. At the same time your wife needs the car to run her errands during the day so you cannot just leave and not shovel the driveway. Then you have to fight the traffic and the long commute into work. The 15 to 20 minutes of snow shoveling can make the difference between an hour delay in traffic. The city snow plow cleared the street and dumped a pile of snow at the end of your driveway. It is too high to get the car out and you just have to shovel. Or again your wife wants to get out during the day and can’t because there’s too much snow at the end of your driveway. What can you do? The snow is way to heavy to shovel some days the snow is that heavy wet stuff. A heart attack waiting to happen when you have to shovel heavy wet snow out of the driveway. Why bother with this at all when you can hire snowplow services to clear your driveway. Hire a snow plow services company that provides snow plow services in your area. Make sure that they will come back to clear the snow from the end of your driveway that the snow plow from the city leaves. Also make sure that they will clear the snow in time for you to get out in the morning to get to work. You may want to confirm also how much snow must fall before they will come and clear driveway. Do you want them to also shovel the front steps? You may not even care about the price they charge. On the other hand asking for quotes from several companies in the area will give you confidence that you are not over paying. You can also ask for references or talk to neighbors who also use a company to keep their driveway clear in the winter time. Sometimes if you and the neighbors use the same contractor he may give you both a deal since he can do two driveways at less cost to him. These are all the various factors that should be taken into account when setting a contract to have have your driveway cleared of snow.